The young are often moved to action by heroic images. Like their heroes, they long to become strong and just. As they are young and inexperienced, the path most immediately obvious to them is that followed by their heroes before them. Uncritical imitation is the first step in the quest of the young to become like their heroes. From time in memoriam, the warrior-soldier is the most likely candidate for a culture’s heroes in that most nations have armies and engage in warfare. In our modern world, where the actual battles now take place in third-world proxy nations, the martial artist has risen to the warrior-soldier level in the eyes of our young due mainly to the impact of the mass media. Turning back the clock to war-ravaged Japan of 1945, the image of the martial artist would overnight supplant the soldier/hero who had gone down to defeat in the devastating conflict just ended. The choice for the 18-year-old Shoji Nishio would be to continue his training in judo in order to develop his body and become strong like his martial heroes. Born in 1927 in Aomori Prefecture, Nishio made his way to Tokyo as a teenager to work just prior to the outbreak of the war. He soon took up judo at a local dojo in order to improve his frail physical condition. When the war ended, training in martial arts was severely limited by the occupation forces and the famous Kodokan Judo headquarters had all but ceased operations. Gradually, as troops repatriated to Japan after the war, activity at the Kodokan picked up and Nishio was able to resume his judo training. An enthusiastic, hard trainer, he steadily rose through the ranks eventually receiving a 4th dan. However, Nishio found himself dissatisfied with judo because of the compromises made to the art’s techniques to accomodate competition. As a supplement to his judo training, Nishio took up karate in the late 1940s under the famous Yasuhiro Konishi (1893-1983), founder of Shindo Jinen Ryu. Nishio practiced karate for several years through 1952, but also found this art limited for similar reasons. There was a strong initiative afoot to modify the traditional techniques of Okinawan karate to bring this art into conformity with modern budo forms—primarily judo and kendo—which had been converted into sports. No one was there and sometimes I would swing a sword and then go home. We were lucky to have five people. It was a time when all Japanese were hungry and only people who could be called martial arts fanatics would come! The people who did come to train were those that had practiced arts like judo and karate, but thought that there had to be something more, something deeper than these arts. So everyone came after having tried something else. There was no one whose experience was limited to aikido. That was not a cause for concern. Today, when people know only aikido, many are filled with doubts. When Nishio joined the Aikikai, the founder Ueshiba O-Sensei was spending most of his time in Iwama in Ibaragi Prefecture. It was a full year and a half before Nishio saw the imposing figure of the founder in action for the first time. What particularly impressed Nishio about Ueshiba’s technique was his lightning fast handling of the sword. Dazzling as his technique was, Ueshiba offered no real explanation of what he was doing. For example, when Nishio inquired of his seniors about the use and importance of the sword in aikido, no satisfactory answer was forthcoming, so he decided to take matters in his own hands. Nisho was convinced that aikido was the true martial path for him. At the same time, he found shortcomings in its practice methods, especially after watching Ueshiba’s incredible sword work and noting the lack of inclusion of sword techniques in the art’s curriculum. To remedy things, as he had done before, Nishio took up the study of iaido (Muso Jikiden Eishin-ryu) with 10th dan Shigenori Sano in 1955, and then jodo (Shindo Muso-ryu) with the famous Takaji Shimizu (1896-1978). Each of these arts contributed to his knowledge of the use of weapons and, in turn, complemented his aikido training. Not everyone was pleased with Nishio’s forays into other arts as his aikido began to take on a unique flavor. Nishio also felt dissatisfied by the relatively few throwing techniques of aikido that included mainly iriminage, shihonage, and kotegaeshi. Little by little, he developed his own innovative repertoire of techniques that included aikido hip-throws (koshiwaza) based on his background in judo. In a like manner, he systematically incorporated atemi modeled on sword movements to facilitate the setup and execution—“tsukuri” and “kuzushi”—of techniques. He also devised sword and staff counterparts to empty-handed techniques drawn from his extensive weapons background. Despite being somewhat out of the aikido mainstream, Nishio nonetheless rose quickly through the ranks achieving 5th dan in 1958 after only six years of training. This was not uncommon in the early years of aikido and many of the principal figures from the 1940s and 50s such as Tohei, Saito, Yamaguchi, Hikitsuchi, and numerous others were rapidly promoted. By the mid-1950s, aikido was undergoing steady growth as many branch dojos, and university and company clubs sprang up all over Japan. Nishio began teaching more and more on the outside and frequenting the Hombu Dojo less and less. He was employed at the Japanese Mint during the day and taught aikido at night at various locations in Tokyo and its suburbs. Nishio’s network of dojos practiced methods that were widely seen as a deviation from the standard curriculum of Hombu that was based primarily on the approaches of Kisshomaru Ueshiba and Koichi Tohei. He did, however, maintain close ties with the headquarters organization and regularly participated in large aikido demonstrations and social events. The founder Ueshiba and his son would often appear as guests at the functions of Nishio-affiliated dojos. 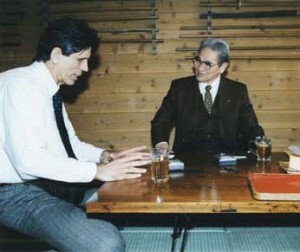 When Nishio retired from his job with the government mint in 1980, he was an aikido 8th dan, iaido 7th dan, judo 6th dan, and karate 5th dan. This signaled a new era as he was free to devote full time to aikido instruction. His activities were not only limited to Japan, but he also made frequent trips to Scandanavia, the USA, and various European countries, in particular, France. Nishio maintained an active teaching schedule including regular trips abroad for some 20 years. Declining health gradually caused him to curtail his activities in the last years of his life. Nishio’s technical legacy is totally unique. Although Morihiro Saito’s aikido also included the use of the sword and staff, what Saito did was to preserve and formalize the founder’s weapons techniques with little modification. Nishio, instead, mastered the basics of several of the modern weapons systems from which he drew many elements in addition to his prior experience in judo and karate. What then emerged as Nishio Aikido is an amalgamation of elements drawn from judo, karate, iaido, and jojutsu built on the aikido technical framework and philosophy. To supplement his martially-oriented taijutsu or empty-handed techniques, Nishio also developed an elaborate series of sword, staff, and iaido variations. Another important concept is the matching of breathing in unison with the opponent. “We don’t disrupt the opponent’s breathing because, in the aikido way, the opponent changes his breathing and we adjust our breathing accordingly.” Breathing is the key component of the process of unification with an opponent and corresponds to the breathing employed when using the sword which serves as the basis for Nishio’s atemi. 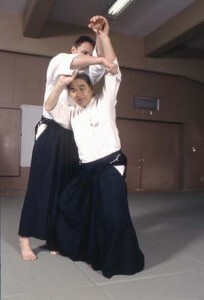 When Nishio explained the use of atemi in aikido techniques he demonstrated their application at successive points in the movement showing that they are always available. No physical contact actually takes place in order to assure safe practice conditions. The movement corresponding to the atemi does indeed neutralize the opponent’s mind and body rendering him unable to continue his attack. In Nishio Aikido, the mechanics of achieving unification with an opponent often include taking a “half-step.” This is a critical concept expressed by the founder that allows the aikidoka to avoid discontinuity and make contact with the opponent. Looking deeper into the idea, we discover that taking a “full-step” translates to opposing the will of the opponent and applying counterforce. In a physical sense, this implies a clash. Applied to social interaction, this is tantamount to imposing one’s will in defiance of or ignoring another’s desires. In contrast, the half-step of aikido facilitates the unification of energies, or, in social terms, a meeting of minds leading to agreement. 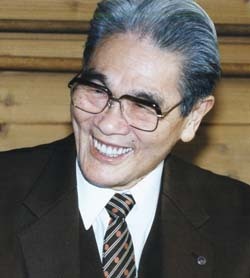 Nishio Sensei, while not imitating the founder’s techniques, took the aikido philosophy as espoused by the founder very much to heart. Among these principles that echo Morihei Ueshiba’s core beliefs is the concept that, in aikido, the intent and movement of the opponent are not opposed. Rather, a process of unification of energies takes place where the breathing and movement of the opponent are mirrored, thus allowing the aikidoka to neutralize his aggression. Having controlled the attack, aikido advocates the forgiveness and rehabilitation of the attacker rather than causing injury or death. Shoji Nishio was one of the strongest advocates of understanding and adapting the profound principles of aikido into one’s personal interpretation of the art. Morihei Ueshiba’s philosophy served as a beacon for Nishio’s thinking and actions in developing his unique form of aikido. O-Sensei’s thinking was great. He made a tremendous change from the former unforgiving, lethal martial arts to a “forgiving martial art.” In this sense, his way of thinking was an advance over Jigoro Kano Sensei’s ideas of “maximum efficiency with minimum effort” and “mutual prosperity.” I think that at the time Kano Sensei came up with the concept of mutual prosperity, it was a revolutionary way of thinking. But O-Sensei’s way of thinking was even more advanced. “Forgiving, giving, and leading” were his words. Previous martial arts, since they were concerned with the taking of life by force, valued forceful seizure rather than giving. Fortunately for posterity, Nishio left extensive pedagocial materials in the form of a four-volume DVD series and a book published by Aiki News. The Nishio Aikido video series consists of nine volumes covering: gyakuhanmi katatedori, aihanmi katatedori, shomenuchi, yokomenuchi, ryotedori, sodedori, and katadori menuchi techniques. In these videotapes, he also demonstrates sword and staff applications of the techniques presented. The last two videotapes cover his sword forms. “Having grown older, and having already mourned the passing of such teachers as Seigo Yamaguchi, who held my highest respect from the very beginning of my aikido career, and Morihiro Saito, who worked so tirelessly to transmit the founder’s aikido in its purest possible form, I began to consider what will happen to aikido from this point on. Aikido—Yurusu Budo is a comprehensive look at Nishio Aikido and present the key principles of his art through the presentation of gyakuhanmi, aihanmi katatedori, sodedori, katadori menuchi, shomenuchi, and yokomenuchi techniques. Both empty-handed versions as well as techniques using the sword and staff are covered. In the annals of aikido, there are perhaps ten or so teachers who have commanded universal respect for their high level of skill and major contributions to the spread of aikido. 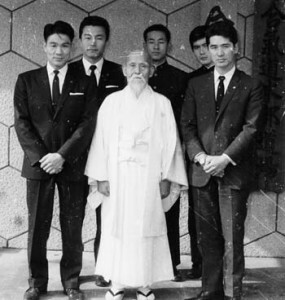 Among this elite list of exceptional figures who have left an indelible impression on today’s aikido, Shoji Nishio stands out as one of the foremost technical innovators and strongest proponents of the founder’s philosophy. All levels are welcome from absolute beginner to very experienced.